I have been online a lot lately, trying to figure out who will retire this coming year. It has become something of a game for me each year to figure out who will be retired and (if I have wanted her for a bit) save up and buy her before AG even announces it. I think it is possible that Kit, Caroline, Addy, Rebecca, and Josefina might be on their way out. Not all at once. But probably one of them will be retired, either winter or summer. That is typically when they retire dolls. I’m going to show my reasons for Kit, Josefina, and Caroline today. The rest will come in the next week or two. – She normally sells really well, and now she is selling really badly. They’ve been featuring her like nuts (BeForever spotlight and all) which bodes ill for her. – The only dolls that are left that have been around for longer than Kit has are Josefina and Addy, and both are non-Caucasian. – Ebay is saturated with hundreds of decent condition Kit dolls. Some people are buying used Kit dolls instead of buying them straight from AG. – People have been dissatisfied with her new BeForever outfits more than pretty much any of the other dolls. – She has been around for quite a while. – She was the only one who did not get her BeForever makeover yet. When Molly was about to be retired, she had a bunch of new stuff released right before. – There have been rumors spread by AGP employees and Personal Shoppers. – Some people think that she isn’t “American” because she lived in a time and place that was owned by Mexico at that point. – She has been called the 18″ Barbie because of her pink dress, blond hair, and blue eyes. – Her hair is harder to care for. – There is a lot of pressure on AG to not make as many blond hair, blue eyed dolls. – She has also had low sales. Right now I think it most likely that Kit will be retired out of those three. I know a lot of people think it will be Josefina, but I think Kit and Caroline should be considered candidates, too. – Her hair is super easy to care for, which means lots of moms buy her for their girls. – After AG has been dropping hints about Josefina’s possible retirement this summer, they’ve gotten tons of backlash, especially as it is right after Ivy and Cecile retired. Some people have been feeling that AG is a bit biased, since the last 9 dolls that have been released in a row are all Caucasian, and most have blue eyes. – Erm….she is new. From 2012. But that didn’t stop them from retiring MG and Cecile, and they had been out for three years. I really think it will be Kit (out of these, anyways), honestly. I might be wrong, but I bet it will be Kit or Josefina. I hope it is Caroline. Kit is a really strong character in the books and some of the historical characters seem a bit conceited and bratty, so I hope that they keep her. Plus, the woman reporter in the 1920’s/30’s plot is becoming a trend in books (e.x.- Hattie Big Sky and Hattie Ever After by Kirby Larson.) She has also been a big seller in the past, so AG might not retire her in the hopes that she will become really popular again. I think that a lot of girls in the target age range (target age range is 8-12 for the 18″.) really like her, Claire and I included. The thing that pushed me to put her on my wishlist was when I found out that she had the dark blue eyes (which only three AG dolls have ever had.) Her character is really fun. Josefina wants to be a healer, (1824 equivalent of a more natural doctor) so I think it is partially important for her to keep her because of that. Seeing as how basically none of them are anything very STEM-focused (not that they really knew much about how the human body worked in 1824) it is nice to see that in a girl’s toy line. I mean, we have a reporter, an actress, a girl’s rights activist (or two? Would Samantha count as one? Or more of an equality activist? ), and a sailor. (I don’t know what Addy and Kaya would really grow up to be.) A girl’s rights activist is a very good cause, but I’m glad that there is someone focused on science. Another one of the things I really like about her is that she is one of the non-Caucasian dolls in the BeForever line. I’m not super fond of Caroline. 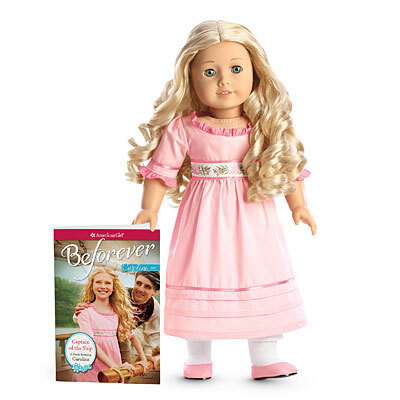 Releasing a second doll with blond hair and blue eyes in the BeForever line was pretty risky in my opinion. I don’t really like her character (she is one of the ones who sounds really bratty in bits of her books) and a lot of her newer clothes are either really cheap looking, aren’t historically accurate, or just not at all appealing. The only things I would even want from her collection is her Travel Outfit, her Nightgown, and her Winter Coat. I think they’re focusing less and less on the company’s values and more and more on marketing and money. I think that it might hurt their sales in the long run, (Pride cometh before a fall 😉 ) and so I hope they make the right decision in who to retire this year. 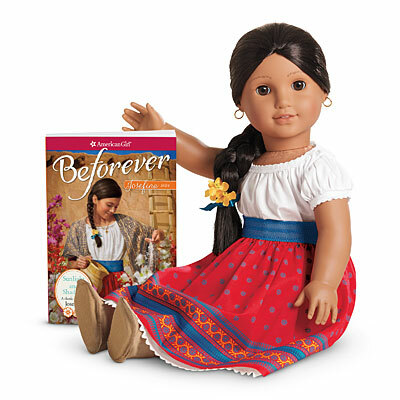 I think that out of all of the BeForever dolls, no matter whether I think they might be retiring or not, I think that they should retire Caroline. I don’t feel like her books are contributing a lot to the line overall, and we have a blond hair, blue-eyed, Caucasian, classic mold doll already, who has a great character. Hmm… Very interesting thoughts about which dolls might be retired. I haven’t been keeping up with the latest news on AG so I found this quite interesting. For Kit, I did read her old books and found her to be quite likeable. Her time period is quite interesting however her outfit totally doesn’t reflect that. As for her blond hair and blue eyes, it is a bit repetitive in AG. I suppose Caucasian dolls sell better and AG is just trying to make money. Back to Kit, being a tomboy doesn’t really help her I suppose. After all, no tomboy wants to buy a doll. However it would be a shame to lose Kit since she been in AG for as long as I remember and has such an interesting story. Josefina, I had no idea there were rumors about dropping her this year. I always thought they would keep her due to her race and her being diverse. However they did retire Ivy and Cecile so I wouldn’t be overly shocked. Caroline, the Barbie doll. She never really did anything for me either. She was just sort of there. It almost was like she was suppose to be the replacement of Felicity and Elizabeth. As she was semi-close to their time period and had “nicer” looking clothes. I haven’t kept up with the books so I personally can’t say much about her personality but still, she doesn’t strike me as the best role model. About your closing remarks about AG, I totally agree. I think they just stopped caring about their customers and values for their marketing and sales. Quite sad, but true. It seem lately there are so many other alternatives to AG dolls that are cheaper or more creative than AG. I wouldn’t be surprised if some other doll company became the new “AG”. Who knows, we can only watch and wait. Great post and now I have to think about if I would want to buy any of those dolls. Have a nice day! Thanks very much! Claire (my sister) and I are very much into several of the slightly older dolls, so we like to keep track of who could be retiring so we can buy our favorites before they retire. Kit’s character is very fun! I don’t like her outfit very much either. I think if they had used a small calico print, and had it all over the dress (like her b-day dress,) as well as taking the belt buckle off and making the buttons be non-decor, it would be very cute. However, as is, it isn’t making me think 1930’s, but instead of something a girl might wear now that is 1930’s inspired. Actually, they only see better because AG makes more. Jess, Marisol, McKenna, and Kanani were the best selling GOTY they have ever made, and McKenna is the only non-Caucasian one. Fair point about tomboys. I have thought about that once or twice, but I think a lot of parents still buy Kit because of how easy her hair is to manage. Same here! Since they have announced they will come out with a black BeForever doll in 2016, I think that one of the reasons they have already announced that is because they might be retiring a more diverse doll this year, so they don’t want to people to be super disappointed because “Oh, well we are coming out with a new black doll next year so everything is rosy.” They really need more diverse dolls, though. Honestly, Caroline is also meh for me. If she had black hair in that style, instead of blonde, and the same eyes, I would like her a lot more. I really would not care if they retired her, TBH. I might get her travel dress and skating coat, but there would be no fuss if I didn’t get anything, you know what I’m saying? Our Generation is more than likely to become the “new AG” in my eyes. At our local Target, they were sold out of pretty much all the dolls except dolls where someone had played with the hair and messed it up, or they might have a small defect around Christmas. I think the fact that 4 out of 18 of the dolls they released in 2014 is definitely an improvement on some of their other releases, and seeing how everything is just as good quality (in terms of outfits and accessories) they could easily beat AG in terms of sales someday. I think you could be right! Rebecca and Addy are still in danger, I think. I’m a tomboy and I have a blog about dolls. I have to agree with you, Kit or Josephina will probably be retiring next :(. I would hate for either of them to be retired, though. I totally agree with you, AG seems to care more about making money than moral values 🙁 I personally like AG dolls a bit better than Our Generation dolls, but I would prefer to give money to OG than AG, as OG seems to be a very moral company. Me too. Claire (my sister) and I love Josefina, Kit, Rebecca, and Kaya, so we are really upset by the dolls that seem like they might retire. I think so, too. I think they are really focused on their image, and covering up any issues they might have. Actually, I read a really cool article about Mattel as a brand overall (You can read it here. My friend sent me that post, but I don’t know about any other content that might be on there, BTW.) I also enjoy AG dolls more, but I have the same issue with the values of AG versus the values of OG. Actually, I really like the value of My Twinn dolls, in terms of a more expensive doll, but still with good values. I just wanted to say that your blog is one of my favorites, BTW. Thanks for the link, I will have to check it out. Wow, that mean’s a lot to me, thank you! Your blog is one of my favorites as well! You’re welcome! Awww, thanks, that is really sweet of you! You’re really great at photography. This morning I was checking in the history/most looked sites on our computer, and yours is one. Wow! That means a lot to me 🙂 Your blog is one of my most viewed sites as well. By the way, I nominated you for an award on my blog! Oh, my goodness! Thank you! I literally just gasped! Thanks so much! Oh, and BTW, thanks a lot for the follow! I don’t like OG dolls and I REALLY hope that they don’t overrun AG!!!!! It would practically kill me. x/ I don’t like how they look. And their hair is way to cheap. Also they look all cheapy. So I REALLY REALLY REALLY hope that they don’t overrun AG!!!!!!! I agree that Kit is in a risky position right now. I really hope they don’t retire her because she was my first AG doll and am rather fond of her. I also hope they retire Caroline instead of Kit or Josephina because Caroline just doesn’t really appeal to me. Her outfits do look a bit cheap and there are a ton of other AG dolls that look a lot like her. I love Kit as well. Actually, since I’ve posted this, then I found out about AG not releasing items for 2 dolls. I was playing the BeForever Endless Style game, and you know how everyone has an extra modern outfit except Josefina and Caroline? If you look at some of the leaked pics (Addy has a turquoise and purple plaid dress) then at the extras in that game, they kinda match. (Addy has a turquoise and purple plaid shirt) I think those will be inspired by the new release, and the dolls that don’t have extra outfits won’t get a release, and therefore most likely be in danger of retirement. In conclusion, I think Josefina or Caroline will not get a release, and out of them I think Josefina will be retired, honestly. I’m going to post a bit more along those lines in the next few days, but that is a brief overview. It’s not true that only girly girls(and not tomboys )like dolls, I am sort of in between because I LIKE DOLLS , but I also enjoy sports and LEGO. Kaya is also a be forever doll and is not Christian . She is Polytheistic , because Native Americans at the time believed in many gods , including gods of rain , sun , and crops. Oh, yeah! I completely forgot about Kaya. Thanks for reminding me! Josefina has gotten some new outfits. And she’s going to have a “BeForever” story in the fall. I noticed! Yay! I have a bit about it in the Retirements 2015 Conclusion post, if you’re interested. Honestly, I really REALLY hope Caroline doesn’t retire because I LOVE her but was planning to get her next year. In my opinion Ag should just retire Kaya because let’s be honest, she’s barely ever sold. Aww, I hope you can get her early if she is retiring, then! It’s no fun to be planning to buy a doll and than have them sell out. 🙁 It’s happened to me before. Really? Huh. That’s interesting. When we went to the AG store, there were lots of girls, probably 11-15, with Kaya, and then a few girls, probably 12-13ish, with Caroline. All the younger girls pretty much had Kit, Isabelle, or a MYAG. That’s really weird. I guess it might vary by the area. I mean, Caroline is from New York, after all. That was interesting to hear what you thought about Caroline. Honestly, I’d love her eyes to make a custom or two (that sounded creepy), but I don’t want to do eye-swaps. (That sounded even creepier). I could not disagree with your comment that American Girl should have less blonde haired blue eyed dolls more! just because most people aren’t lucky enough to look like us, doesn’t mean we don’t deserve credit for it! I’m sorry that it sounded like I do not like that hair/eye combo. I probably should have phrased my sentence a bit better when I said that. Just to clarify, I do love the blond hair/blue eye combo, and I actually have 3 dolls with it. What I don’t like is when a doll brand (AG, Barbie, Polly Pockets) makes a doll with that combo that is one of the most advertised, and acts like that doll is the best, because they have that specific hair/eye combo. When that happens, I feel that it can be upsetting to people if they feel that they aren’t pretty or special, and I feel that it also promotes the “perfect body” stereotype that a lot of girls in this generation have. I also feel it is a misrepresentation of the awesome diversity and differences in the people as a whole in our country. I have a somewhat common hair color, yet there has never been a 18″ doll with it, though AG has 9 dolls with the blond hair/blue eye combo. I did some research, and if AG has created 8 out of 61 of their MYAG dolls (which is 7.6%) and the average percentage of people born with that hair and eye color combo a year is 2.3%, I don’t feel that that is something that I would like to encourage. My hair color (as mentioned before, it is a fairly common color) and blue eyes (which is the most uncommon eye color for my hair color) is still 27% of females, and AG has made 0 dolls with it. So, in short, while I love that hair and eye color combo, I do not appreciate the “this hair and eye color combo is better than all others” attitude that some people have. I just got an email from AG saying Get her before she is gone….they are retiring CAROLINE. Yep, I saw just a while ago! Wow…I find the comment about the blonde haired, blue eyed dolls offensive. I have twin girls with blonde hair and blue eyes. My husband and I both have dark brown hair and I have brown eyes. My girls’ first AG dolls were both brown headed dolls, but now they are wanting Caroline since she has blonde hair like them. So now blonde dolls are considered bad and unwanted? sheesh…what is this world coming to???? I hope they don’t retire Josefina I want her she is on my list. I don’t care if they retire Caroline or not. I hope they don’t retire Josefina, too! They won’t retire her this year, though, which is good-they just announced Caroline’s retirement. Yes, I am extremely happy that Caroline is retiring. I do agree that AG should just add more BeForever characters, but as they won’t, I’m happy that Caroline is. Actually, my sister, my 5 doll loving friends, and I (all in the target age range) have all read every single Caroline books, except the newest mystery. We all think she is extremely bratty in the books. I love the War of 1812 (love as in I think it’s extremely interesting), and I’m extremely upset that they did (in my opinion) a bad job of it’s representation. I would love a Wild West (California Gold Rush doll, anyone?) doll as well, and while there were children who were there, it was mainly adults. IT was just too dangerous for kids, especially girls, in a way that I won’t get into here since there are younger kids who read doll blogs. Actually, I’m a tween, though I’ll take the fact that you thought I was an adult as a compliment. And while I get that little girls are devastated about dolls being retired, I have only seen one or two girls in the 10 and under age who have Caroline, and I’ve seen a lot of dolls in our city. I think the reason they archive dolls is because they don’t have enough money to fund a large historical collection. And honestly, the doll market is suffering. The amount of money they would need to put into the line would be a lot, and they wouldn’t be able to get a return so quickly. This is why they have to get rid of some. Personally, as much as I ADORE Kit, I believe she should’ve been the one to go. We need a 1920s character. Kit’s retirement would allow that to happen. A wild west character might be fun, but then Josefina would be threatened because technically she lives in the Wild West, as the West was owned by Mexico. Kirsten was also a doll that focused on westward expansion, even if she just moved to the Midwest. Exactly. Archival is pretty important for the success of the line, as sad as it makes us all. A 1920s character would be really fun! I love Kit, but she has been around for quite a while. I think they’d end up doing something really stereotypical. It’d be cool, though. I diasagree with retiring Caroline because I have one and she is nothing like Barbie. Any other doll or even girl acne have blonde hair and blue ayes and people still say they look like Barbie. Caroline has a very inspiring story and teaches girls to stand strong and be brave! Her hair is curly and a little bit hard to manage but any doll with curly hair I hard to manage. In my opinion they should retire Joesphina. hey i think that you are totally right because i just got a magazine and Caroline is going away. Yes, Caroline is retiring. Actually, Josefina and Kit are both not at this time. Unfortunately, Caroline is retiring. Her “official” retirement date is August 27th, though I bet she will sell out before that. hearing this news about Caroline/Kit/Josefina retiring shocks me. I have Kit already so I wouldn’t be sad. Caroline never appealed to me, but I did find her eyes interesting. She reminds me a lot of Lanie, except with much longer hair. I’ve heard a lot of Josefina retiring next year (as the goty might be Hispanic and her rumored best friend, and people say this would be a good time for ag to retire her) and I plan on buying her around Christmas time this year so that if she does retire 2016 I won’t fuss over her. I remember last year when they retired MG and Cecile, I got Cecile in 2011 when she was released and barely got MG as she was almost sold out in 2014. it would be a shame to retire anymore, and also the fact that new BeForever ME really reminds me of a red head Lanie…. Hi there! This is a great article you’ve written. I really enjoyed reading all the reasons. You definitely have some really good points. I haven’t read all of the comments so I apologize if this has already been talked about. However, Josefina actually did get an outfit change. This website (http://americangirloutsider.blogspot.com/2014/11/historical-clothes-reviews-josefinas.html) actually talks some about the differences between her historical outfit and her BeForever outfit. I was never interested in the doll of Caroline.I love Caroline’s books though! sadly she is retiring as well as Josefina. I don’t know about Kit though my birthday is soon and I’m getting 2 ag dolls and one of them i hope to receive is Kit stay Kit stay! I hope Kit and Josefina both stay for a while! Claire (my sister) and I are saving up for Kit right now as well — I hope we can both get her! Josefina’s not retiring. They gave her some new products along with Kit. Unfortunately Caroline is the one who will be archived. I have a feeling that Josefina’s here to stay. Actually, the color of her eyes really depends on the lighting. They show up more green in pictures, yes, but in person they’re much more blue. One of my friends has her, and she (and I) agree that they’re a very bright, light turquoise, with a few minty-green type bits. Another thing to remember that might be coming into play with Caroline’s eyes is how we perceive color. For one person they might be light blue, for another they might be mint green. There was a picture of a dress that came out a few months ago, and about half the population thought it was light blue and black, and the other thought it was gold and white. It was actually dark blue and black! Isn’t that odd? So I think it actually might be possible that maybe (since they’re blue with a little bit of green) our brain tells you and some other people that they’re green, and me and my friend and some other people that they’re blue. Your wish has been answered: Caroline is being archived. I really wish they wouldn’t archive so many dolls. I want them all, and if someone sells them on Ebay after they are gone, they cost a ton! I do too! I sure hope they keep her for a while! Supposedly this year it will be Rebecca, Addy, and I think maybe Julie or Kit. Caroline seems bratty to me in the books but I changed her attitude when I got her. Um will you still post because you have not posted in a long time. Yes, I definitely still will! I’ve been planning some fun posts — stay tuned for more! That’s why some people think Kit will be retired – she is an older doll and she hasn’t been selling as well since the Beforever re-vamp. Thanks for sharing your opinion! IF AMERICAN GIRL READS THIS THEY SHOUD NOT REATIRED WICH EVERE DOLL, THEY SHOULD REATIRE THE OLDES BEFOREVER DOLL IF KIT REATIRES IN GOING TO GO CRAZY BEACOUSE I WANT HER ,HER HAIR IS SO MANIGEBLE FOR GIRL BEACOUSE IF SEEN VIDIOS OF LITTLE GIRL THERE DOLLS HAIR IS HOOOOOOOORIBLE . THEY SHOULD REATIRE REBECCA OR JULIE BEACOUSE THERE THE OLDES . Well, Josefina is actually the oldest (came out in 1997), and then Kit is the second oldest (2000), and then Julie (2007), then Rebecca (2008 – I remember her coming out! ), and then Caroline (2012). American Girl also doesn’t always retire because of how old a doll is – Caroline was about 3 years old when they retired her, and Cecile and Marie-Grace were two! It depends on how well the collection and the doll are selling. For all of the dolls I just mentioned, they sold a lot of the the dolls but not as much of the collection, and I know I’m not the only one who thinks that that’s why they retired them. I think Kit should stay her story’s are amazing she’s one of my favorite beforever doll beside Melody and Kristen ! I don’t think all tomboys are one-dimensional. I’m a serious tomboy (I hate skirts and the like), but I LOVED Kit when I was a kid and still do! I think people have many different sides to them. I don’t necessarily see “gender” when I see a doll I like. I know plenty of boys who like American Girl, especially Kit and now Logan. I think the problem is that the doll industry isn’t doing well overall. The dolls that suffer are the ones that don’t look as “pretty” or “interesting” or “diverse” or don’t have a very relevant collection. Because Kit’s a tomboy, she has a harder time selling to these girls nowadays who want the curly dos and pastel pinks and sequins floating around (aside from the fact Beforever isn’t selling as well as the modern girls anyway). Kit’s collection is also very Depression-oriented. That means her collection won’t be as glamorous as say Maryellen or Melody. My reason for believing Kit is being archived is because I believe American Girl wants to release a 1920s character. It’s my heartfelt wish mostly. XD Kit has many fashions borrowed from the 1920s, so retiring her would allow them to make a new character from around that time period. Caroline was retired. Josefina and Addy are still around and hopefully will stay around awhile. The only way I would accept Addy leaving is if American Girl created a 1920s Harlem Renaissance character, maybe even one from New Orleans during the Jazz era. I do agree that people of all interests can like dolls. When I originally wrote this, I think I was commenting more on the fact that no one I personally knew who might be considered a “tomboy” liked dolls. I had a few friends who struggled to connect with Kit because she disliked dancing and frilly dresses, and at the time those were things that my friends and I liked a lot. I think that was more my thought process behind that – that less “tomboys” I knew liked dolls, and that some people had trouble connecting with her because she had different interests. Now I really like that she does, though, and I appreciate her character a lot more. I still think that her sales suffer because, like you said, “she has a harder time selling to these girls nowadays who want the curly dos and pastel pinks and sequins floating around”. I do appreciate that she doesn’t have as nice/fancy clothing as some of the dolls. It’s one of the few things AG is doing that’s historically accurate! It’s also a nice alternative, and I actually prefer a lot of her clothes to those of some of the other dolls for that reason. I think a lot of the target age range does prefer the others, though. A 1920s doll would be so much fun! I’ve been behind on fandom news recently, but is there still a lot of rumors about a Harlem Renaissance doll? I’m not sure that they would do that, since Melody is relatively new, but I’d love it. Wasn’t Addy just retired though? The news I’ve heard is that she is about to be. I know the store near me stopped selling her. I sure hope they don’t retire Josefina. She’s a gorgeous doll and I don’t think retiring their only hispanic doll is a smart move. It made me really sad -well, not really sad- when you said you hoped it would be Caroline who is retired. I think she is a very beautiful doll. And I’ve read all of her books. They were wonderful! Anyway, I have no idea why people would want her to retire. I understand if they retire her if she’s not selling well. And America is a place of many people and of different looking people and many girls want their dolls to look like them. But it will still disappoint me if she retires. I agree that is a beautiful doll, and I liked that she was from a time in history that isn’t as well-known. My reason for saying that I hoped that it was her was largely because someone needed to be retired, and I felt that she brought the least to the lineup at the time. I did like a lot of things about her, though. While Caroline (the doll) had good sales, her collection also wasn’t selling very well, and she was also yet another blond-haired blue-eyed doll at a time when the line desperately needed more diversity (and it still does, though it is better). However, I definitely agree with you that she is a beautiful doll and I liked that she was from a lesser-known period of history. I’d prefer that AG never had to retire a doll, but in that particular situation I think they made the right choice to retire Caroline. Anyway, thanks for reading! I always like to hear people’s opinions on retirement and why different dolls should/should not be retired.